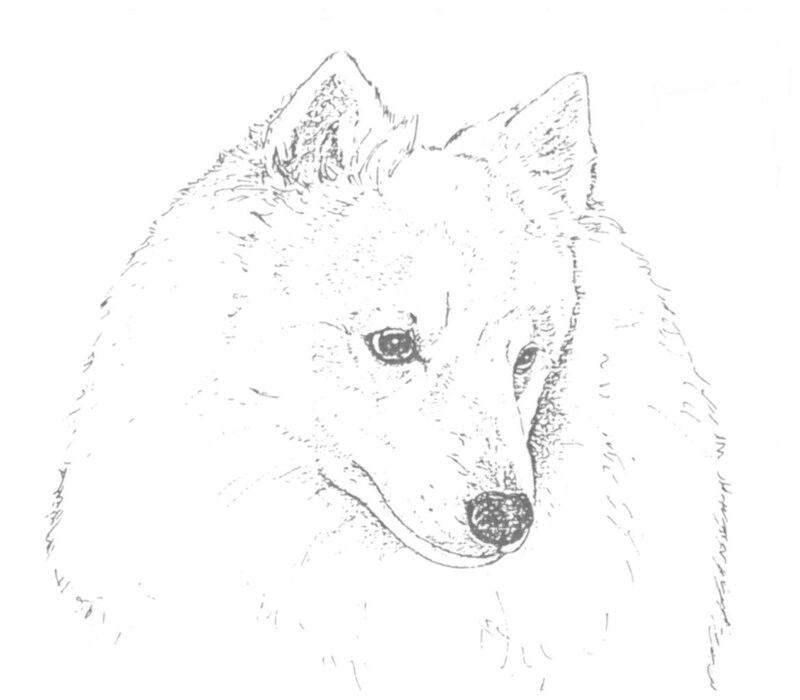 : The origin of the Japanese Spitz is said to be the large-sized white German Spitz brought to Japan around 1920 via the continent of Siberia and northeast part of China. Around the year 1921 the breed was first exhibited at a dog show in Tokyo. : Covered with profuse pure white coat, with pointed muzzle, triangular pricked ears, and feathering tail over back. The constitution tough and the whole well balanced, its harmonious beauty causing spirit and dignity peculiar to this breed, and expressing elegance. : Intelligent, cheerful, keen in sense. Noisy not permitted. : Size in balance to body, moderately broad and rounded. : Forehead moderately developed. Rear part of skull broadest. : Small, round and black. : Pointed, the tip slightly round, and well balanced. Lips tight and preferably black. : Teeth white and strong with scissor bite. : Moderately large, almond-shaped, set slightly oblique, dark in colour. Black eyerims. : Set on high, small, triangular, pricked, facing forward, and not too far apart. : Moderately long, muscles well developed. : Wide and deep, ribs well sprung. : Set on high, moderately long, carried over back. : Shoulders well sloping, forearms straight, elbows tight. : Cat-feet. Pads thick, and desirably black as well as the nails. : Muscular, stifle and hock moderately bent. : Outer coat straight and stand-off. Undercoat short, soft and dense. The foreface, ears, front of forearms and part below hocks are short haired, and the rest covered with abundant long coat, especially from neck to shoulders and forechest covered with beautiful frill, and the tail also has long profuse feathering. Tail not carried on back.